Great bookends to help keep those volumes of knowledge and fantasy confined to their place on your shelf. We have many different styles, shapes, colors and sizes. Animals, structures, sculptures and more are located within our many categories. Most of these products ship within 7 business days plus a few days transit depending upon your location. Measures 5 1/4 inches inches x 5 inches x 3 1/4 inches. Brilliantly hand painted colors. SHIPPING: 95% of our orders are shipped within 7 business days plus transit time. 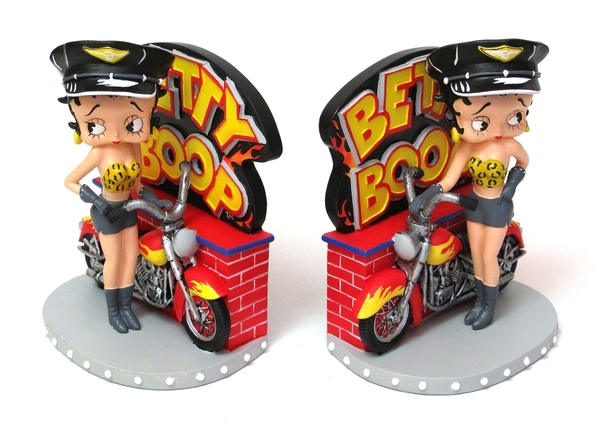 The High Quality Resin Biker Betty Boop Bookends Set is handcrafted and hand painted.